Hi, my darlings!! I seem to have come down with a stupid cold tonight but I didn't want to wait a minute longer to post this review!! As many of you know, I've been working with Rainbow Honey for much of 2013, so this particular package in the mail was very exciting to me--it brought home the fact that I've been with Dee of Rainbow Honey for quite some time now and that ColorSutraa has been around long enough to actually be able to do "BEST OF" posts! YAY on both counts! 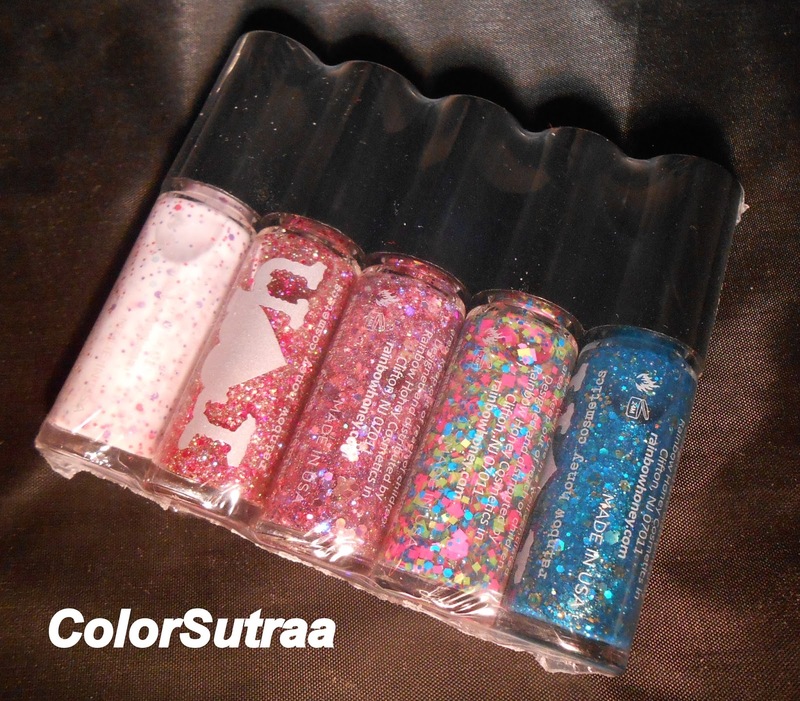 This package contained 4 of Rainbow Honey's top sellers in 2013 and when you take a look at the swatches below, I think you'll see why--each and every one of them is GORGEOUS!! This package ALSO had a sneak peek polish from her upcoming Midnight Garden Spring collection. So, without further ado, let's jump right in, shall we? First up, I have for you Sweet Talk--a white crelly polish with small and medium purple, dark pink and baby blue hexes with added shimmer! 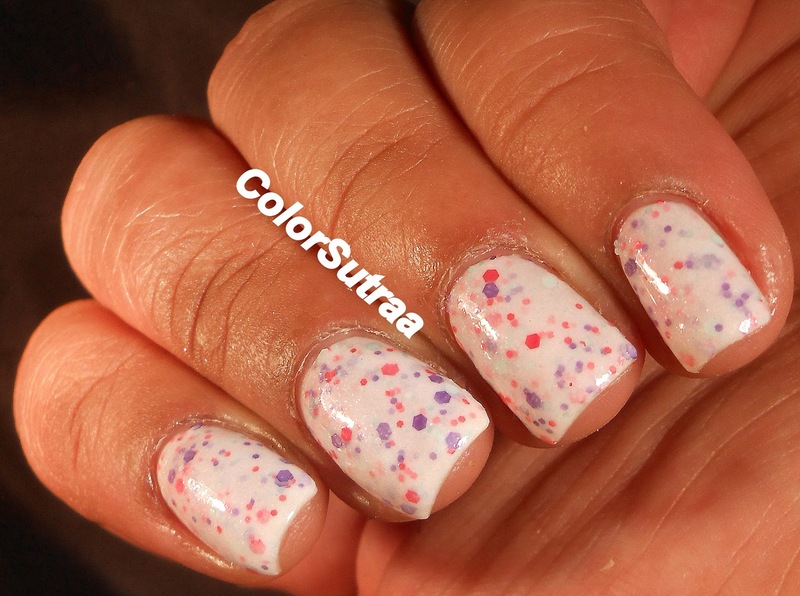 The application and formula on this was fantastic and the swatches below show 3 coats of Sweet Talk by itself, topped with 1 thin coat of G&G's HK Girl to bring it all together. This polish was part of her Sweet Talk collection for Valentine's Day of 2013 and I love how girly and pretty this polish is! 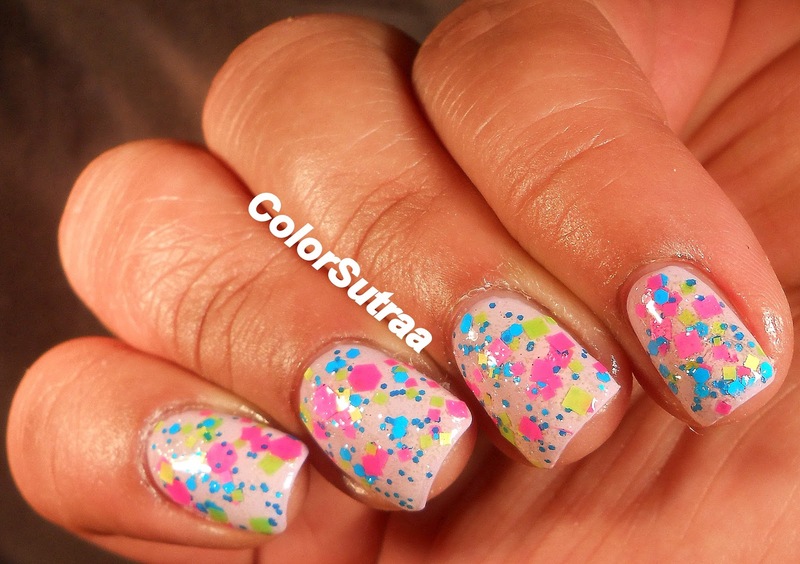 Next, I have for you Magic Cake--a clear glitter topcoat full of neon matte pink, blue, green and yellow glitters in various shapes and sizes! 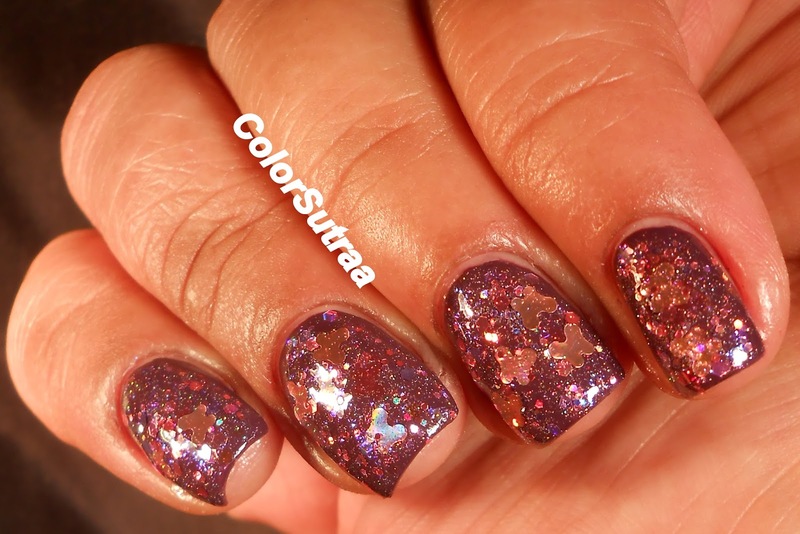 I had no issues with either the application or formula and the swatches below show 2 thin coats of Magic Cake, over two coats of OPI Rumple Wiggins, topped with 1 thin coat of G&G's HK Girl to bring it all together. This polish was part of her Summer of 199X collection and I adore how bright and fun this polish is! 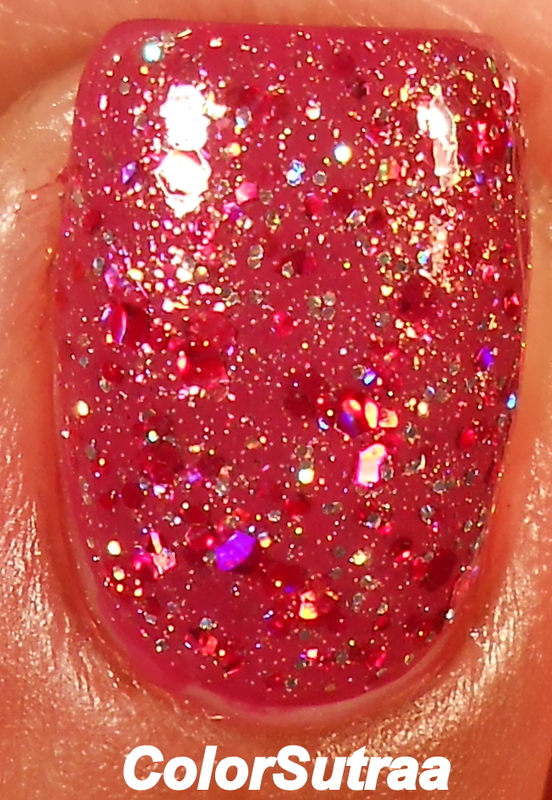 The third polish I have for you is one of my three favorites of the bunch, XOXO--a clear glitter topcoat full of red, gold and holographic microglitters, teeny tiny hexes and flakies! Again, no issues whatsoever to report with either the application or formula and the swatches below show 2 thin coats of XOXO, over two coats of Sheswai Totally, topped with 1 thin coat of G&G's HK Girl to bring it all together. 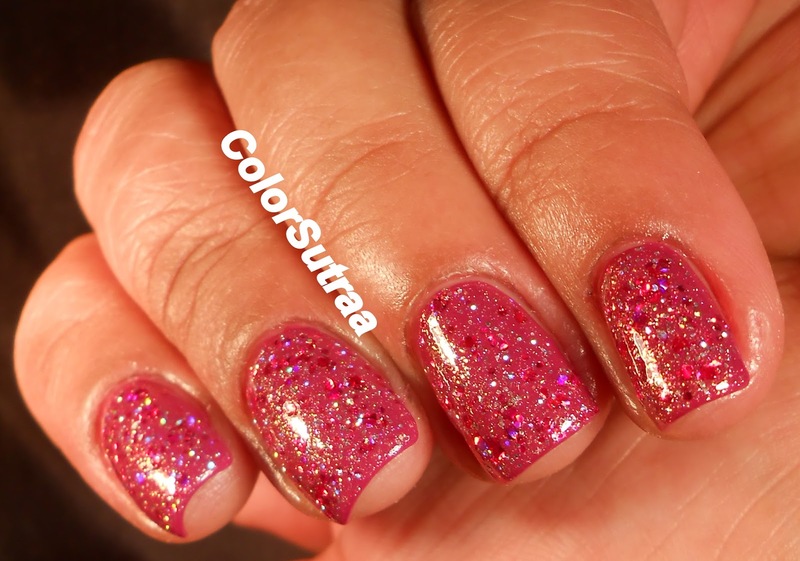 This polish was also part of her Sweet Talk collection for Valentine's Day of 2013 and the sparkle of this polish just blew me away! 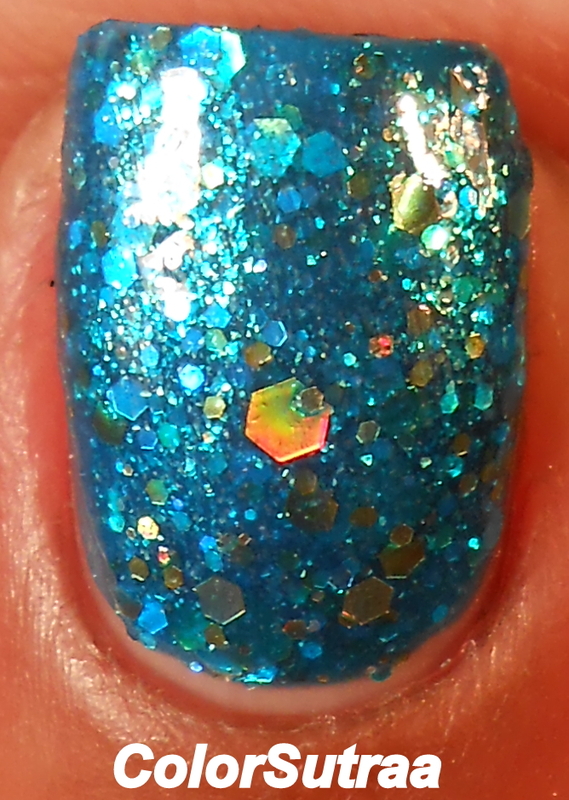 Next, another favorite of the bunch, The Kraken--a gorgeous turquoise/aqua blue jelly polish full of blue, green and holographic gold glitters with added shimmer and flakies in matching colors! The application and formula was such a pleasure--no streaking, no dragging, very little mess and NO visible nail line! The swatches below show 2 generous coats of The Kraken by itself, topped with 1 thin coat of G&G's HK Girl to finish the look. This polish was also part of her Summer of 199X collection and I'm absolutely in LOVE with how stunning this polish is! 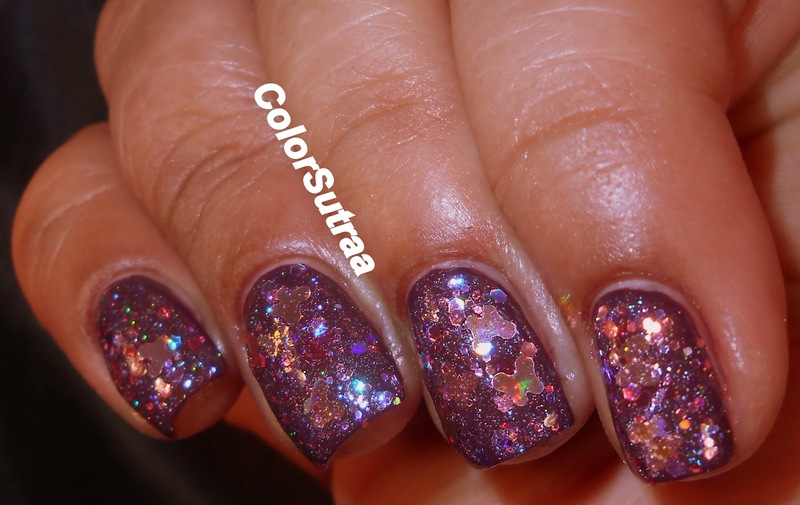 Last but definitely not the least, I have for you the sneak peek polish and my absolute favorite of them all, Papillon--a clear glitter topcoat full of small light pink holographic hexes and large butterflies, plus iridescent small hexes and an added holographic shimmer to die for! Fabulous formula and application--just a little swirling of the brush in the polish and out popped all these gorgeous butterflies! The swatches below show 2 thin coats of Papillon, over ONE generous coat of Sheswai What, topped with 2 thin coats of G&G's HK Girl to finish the look. I cannot TELL you how obsessed I am with this polish--after months, I did a full manicure and, if you follow me on Instagram, you'll see how much time I spent just gazing at my nails in different lighting! If this polish is at all predictive of this upcoming Midnight Garden Spring collection, I am BEYOND excited to see the rest of them! So there you have it, my darlings! 4 best-selling shades from Rainbow Honey's 2013 collections and a sneak peek from a very exciting upcoming collection! If you're as in love with these polishes as I am and need to add them to your stash , you can find them HERE for $10 for a full-size, 15 mL (0.5 oz) bottle. Be sure to follow Rainbow Honey's FACEBOOK PAGE and INSTAGRAM for all the latest news and updates! Which of these is YOUR favorite? As always, I look forward to hearing from you in the comments section below!